As you can read here, the reason behind this campaign was to discover whether, by giving the entire product range the same Triple Action technology to match that of their UK’s No1 selling Serum, they would deliver extra beauty benefits when used together. Matrixyl 3000 PLUSTM – No7’s most effective anti-wrinkle technology is a powerful peptide blend which helps restore more youthful looking skin. Hyaluronic Acid – helps provide additional skin-firming benefits through its water retaining abilities. Hibiscus extract – from the seed of Hibiscus Abelmoschus, rich in peptides and amino acids, this active ingredient helps support collagen production, making skin look and feel smoother and firmer. Lightening Complex – containing Emblica (Indian gooseberry) and Vitamin C. This works to help rebalance melanin content in the skin, helping to fade pigmentation, promoting a more even skin tone. 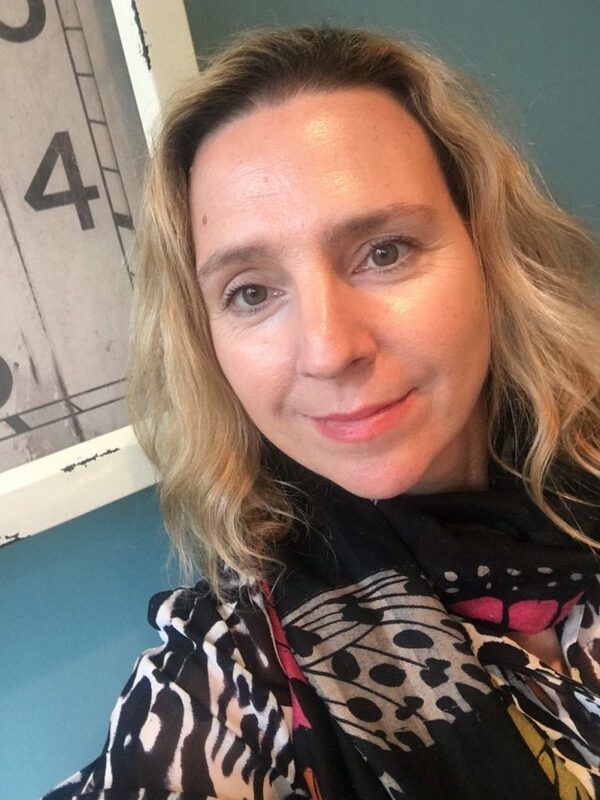 With recent research undertaken by No7 on the efficacy of using the products together proving so positive, I accepted the #BetterTogether challenge with relish and have been religiously applying the serum, day cream/night cream and eye cream twice a day. My initial thought was how easy and fuss-free it was to have just 4 products lined up on my dressing table to use instead of my usual, more random routine of dipping in and out of a myriad of lotions and potions. With the ingredients in each of the Lift & Luminate products designed to complement each other, it takes away the guess work that often accompanies the results of a more disorganised routine, whereby you may not be sure which of your choices is working well or which one is perhaps ‘letting the team down’. I LOVED: I found the fragrance of the products just how I like it – non-assuming, clean and fresh. Unless it’s a body/bath product, I don’t want the olfactory experience to take anything away from the skincare doing its job, which is to make my skin look great! So that was a plus for me. My routine became a welcome part of my day or evening and no matter how tipsy tired I was at the end of the day, it was always easy enough to massage in my serum and cream and to pat on my eye cream. No faff skincare is my kind of thing! I LOVED: By week two, I actually found it a pleasant little night time ritual when applying my eye cream, to take a bit of extra time using my ring fingers to do a DIY ‘pat and press’ around my eyes to help drain away excess lymphatic fluid to help prevent puffiness. The eye cream formulation was ideal for massaging around the eyes as it was light and super hydrating, plumping up those crowsfeet perfectly. From my intense scrutinising in the mirror, I think week three was when I started to really see a difference in my complexion. Makeup was sitting better and my skin tone was starting to look more even – particularly on the cheeks. 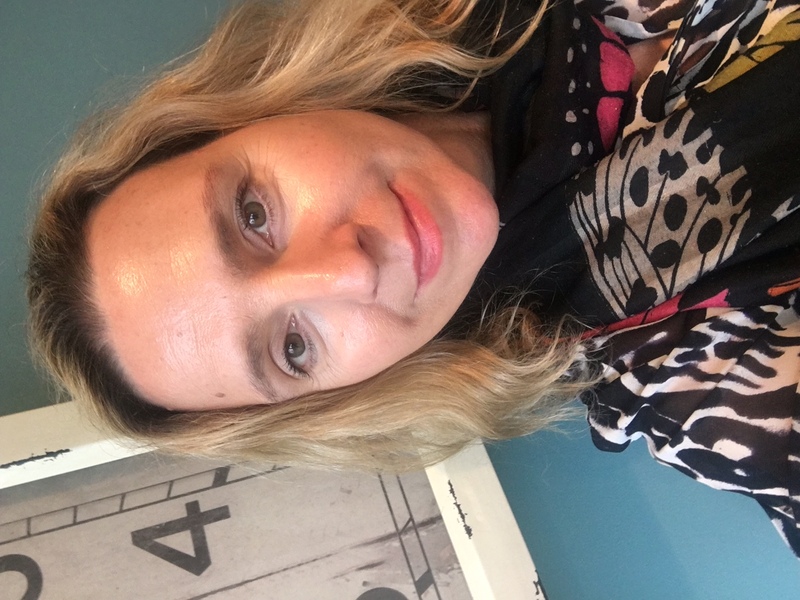 The biggest plus for me was that I realised I was waking up with a rested and brighter looking complexion that needed less makeup to improve it. I LOVED: From the beginning of the trial, my skin felt well moisturised and supple and because of this, it was the perfect base for applying makeup. I was pleased about this because I’ve often found that some products designed for mature skin can leave it feeling a bit tacky or greasy. Lift & Luminate has been proven to help tackle the three most common signs of ageing – wrinkles, sagging and uneven tone. 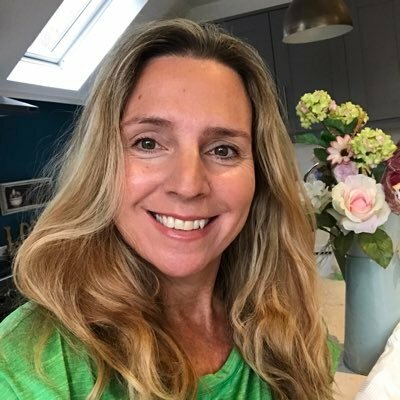 I believe that after my four week trial, the improvement in my skin is confirmation that as a skincare regime these products really are #BetterTogether. Plus, the recent compliments I’ve had from friends “Your crowsfeet have disappeared” (they haven’t, but they have softened) and Stressed Husband “Are you having secret Botox?” are great too! 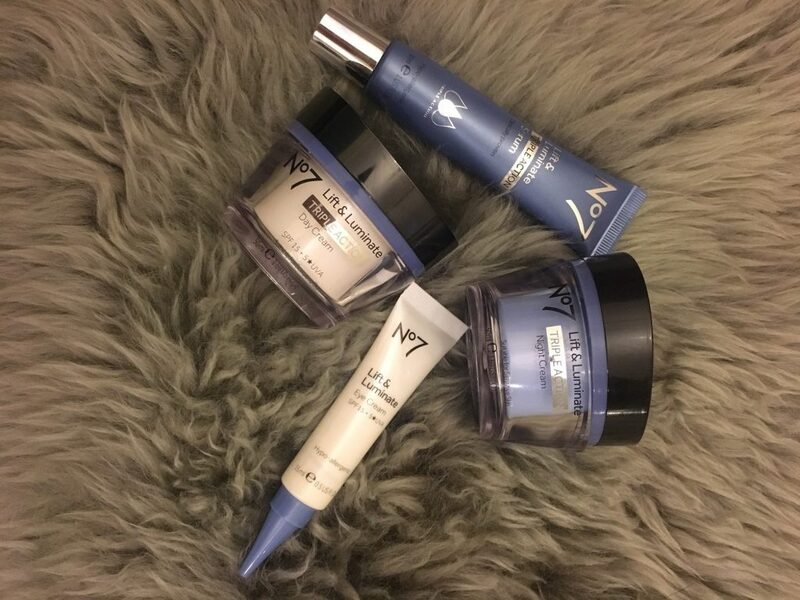 I LOVED: As a beauty blogger, I’m excited that I have a host of products lined up and ready to start testing now that I’ve completed this No7 trial, but as a 49 year old woman who only wants to recommend and invest in hardworking products that deliver on their promise, these No7 little beauties will never be far away from my dressing table! 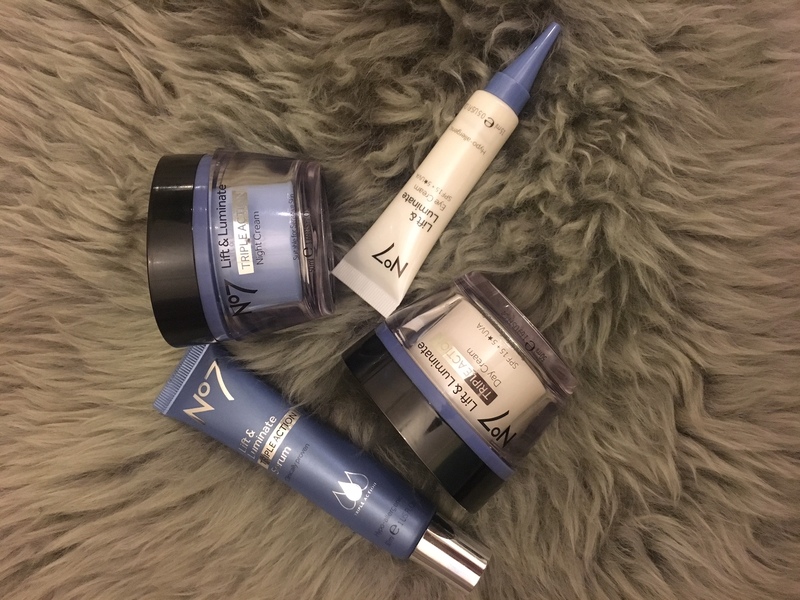 The No7 Lift & Luminate Triple Action range is available in Boots stores and on www.boots.com priced from £17 to £24.95. This post has been sponsored by Boots No7 but all opinions are my own. Next Post Permanent Hair Removal – Here I Come!